With production starting this summer on the Model 3, Tesla is doubling the number of Superchargers to over 10,000 stations on the road by the end of the year. Plans to expand destination chargers that are located in and around hotels, parking structures, and some restaurants will also increase to 15,000, up from 9,000 at the beginning of 2017. All in a plan keep promises to investors and make charging electric cars for customers across the globe that much easier. All of the future plans were announced in a blog post published on Tesla.com yesterday. The post revealed a more in depth plan as to the goals Tesla has for its Superchargers around the world. According to Tesla, it operates 830 Superchargers around the world in over 31 countries, totaling 5,400 charging connections, not including any destination or public charging facilities. A nice piece of the puzzle was Tesla’s new “goal of making charging ubiquitous in urban area.” In particular, the goal to add chargers alongside curbs in major urban areas to allow greater convenience for charging. 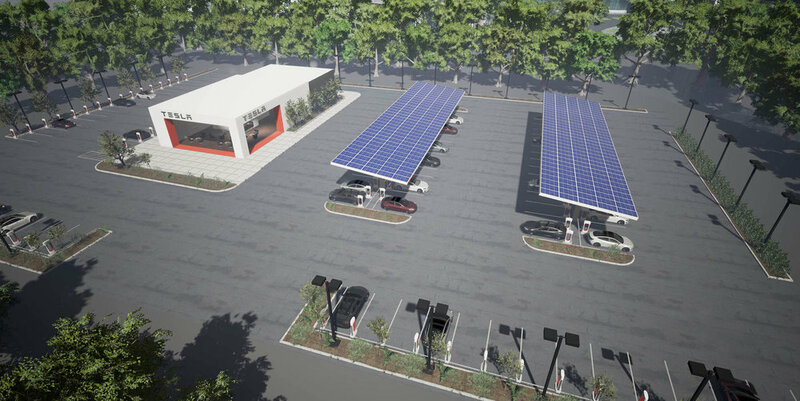 The company also plans to build “larger sites along our busiest travel routes that will accommodate several dozen Teslas Supercharging simultaneously.” A model of one of these larger facilities is pictured below. Over the last few months, especially as more Teslas have gotten onto the road, Tesla has had increasing problems with overcrowded Superchargers. The company introduced a $0.40 per minute charge for every minute a charged vehicle is left parked at a charging station, and new Tesla buyers will have to pay a flat rate for charging at Superchargers after running out of their yearly limit (~1,000 miles). Tesla has stated many times that all profits raised from these charges would all go back into funding more Superchargers. It appears Tesla has put its money where its mouth is with major plans to increase its charging options so drastically in the next 6-7 months. Tesla says it will increase the number of Superchargers in the U.S. by 150% with over 1,000 Superchargers being built in California alone. With the Model 3 right around the corner, sales continuing to climb, and continued overcrowding at Superchargers and charging stations alike, the move couldn’t come at a better time. With more charging opportunities becoming available, potential buyers will have one less reason to avoid getting an all-electric vehicle. Look to see if a Supercharge will be opening near you with Tesla’s planned Supercharger locations map here.